Our fun, no-frills birthday party has everything you need for an incredible afternoon. This $80 package includes admission and rentals for 8 kids, 2 pitchers of soda, and a private party table for 2 hours. Ready to party? 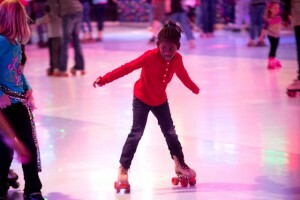 Call Carousel Skate to plan your kid’s birthday party or book a party online. When you book a birthday party at Carousel Skate, you’re guaranteed an unforgettable afternoon. We’ve been in the party business a long time. We have every detail down to a science, giving you the best setup, cleanup, food, entertainment, music, and more! Our facilities are equipped for parties large and small, public and private. Why will you love a skating party at Carousel Skate? It’s fun! Whether you’re teaching your kids to get excited about staying active, or you’re reliving your glory days as a 90’s rollerblade kid, nothing beats the excitement of a roller-skating birthday party. Grab your friends, tell us your favorite top 40’s tunes, and get ready for a day of laughter and play! It’s what we do. You might say we’re the party experts. We’ve been perfecting the party game since we opened in 1982. That’s a lot of time to get it right! We’re family-friendly. Stop worrying about your kids getting exposed to coarse language or suggestive images at a venue that caters to older crowds. Carousel Skate provides a wholesome, family-friendly atmosphere, where people can have a blast whether they’re age 9 or 90! They’re easy to plan. We know you have a lot on your plate. Don’t worry, we’ve got this. From planning to set up, supervision to clean up, we’ll take care of you every step of the way. They’re affordable. Your budget shouldn’t stop your kids from having a fantastic time! We offer a variety of party packages, giving families options with add ons for every price range. Ready to celebrate? Book a birthday party in Wichita. Call Carousel Skate to plan your best ever birthday party today! When you’re throwing a birthday party, the last thing you want to do is spend the whole event grabbing trash, cleaning up spills, and keeping kids out of trouble. Parties are supposed to be fun, and not just for the kids. 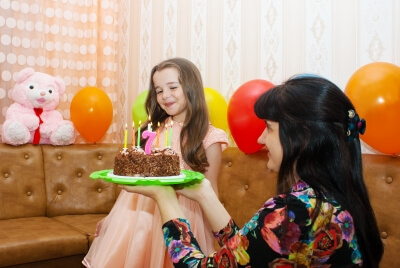 Take your next family birthday from all work to all play! Carousel Skate gives you more laughs, more excitement, and more time with the birthday kid. Sounds like a no brainer to us! Children’s birthday parties can get overwhelming fast. At Carousel Skate, we take all the stress of planning, supervising, and cleanup so you can focus on what’s important: your kids! When you book an event at our Wichita birthday party venue, we’ll take care of the setup, foodservice, and cleanup. What’s on your to-do list? Capturing the birthday kid’s mega grin as he or she skates, opens presents, and digs into the birthday cake! Unlike other venues, we allow guests to bring in cake or cupcakes for their birthday celebrations. We also provide tablecloths, plastic plates, and utensils for your party. Choose the party that fits your budget. Each of our roller-skating party packages includes a private party table, 2 hours of skating fun, and help from our party hostess when you need it. Ready to make a memory? Call Carousel Skate to book a kid’s birthday party today!